You know that feeling: you’re excitedly flicking through the latest print publication of a magazine, almost tearing the pages as you flick, finally, there it is: A double page spread of your favourite photographs. Captured by you. Along with your captions and thoughts. You’ve seen it as PDF before it was published, approved the final version and yet, there it is in glossy print, in your hands, in front of your eyes. Your hard work gone from digital back to physical again. I love that feeling! Last year I had the honour of writing the photo tips section for one of my favourite travel Australian magazines: GetLost. The magazine seeks out unique travel experiences around the globe for travellers wishing to explore and take holidays that are not found in brochures. It covers locations to stay, bars, food, festivals, travel gadgets, eco-travel ideas, and a range of activities from all continents, so people can experience local cultures away from hoards of other travellers. 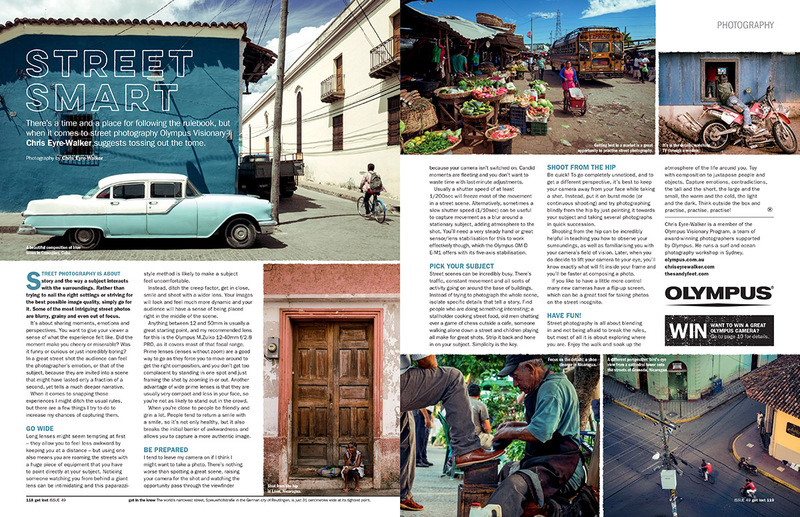 In issue 49 I shared a range of street photography tips along with some of my favourite street shots of Cuba and Nicaragua. Magazine content: Banish the winter blues with 12 of the world’s best island escapes that will have you grabbing your passport and hightailing it out of here. Meet the cowboys of South Dakota, uncover the cool side of Seoul, join a celebration of beards, booze and battleaxes in England, and hike into Chile’s peaceful Lake District. Plus there’s Antarctica, Ecuador, India and more. 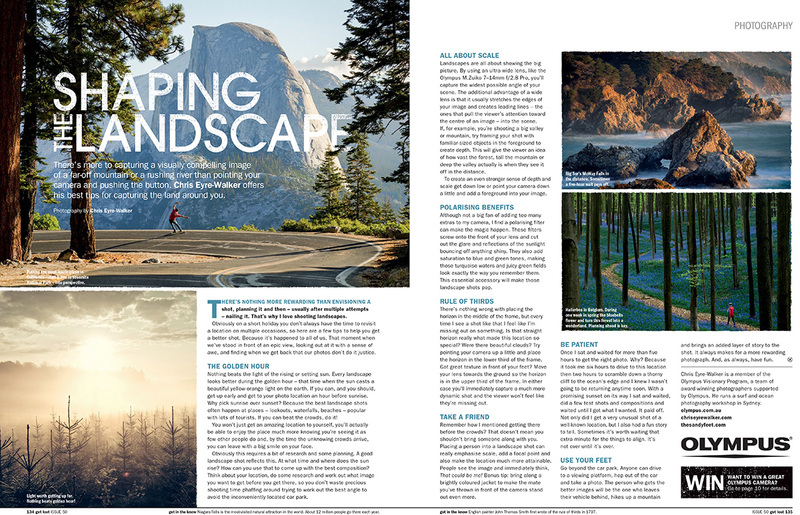 In issue 50 I shared a range of landscape photography tips along with some of my favourite landscape shots all around the world. Magazine content: It’s our fiftieth issue! Experience bedtime bliss around the globe, when we share 50 epic places to stay. Get friendly with nature in Canada, head high into the Peruvian Andes, swim with humpbacks in Western Australia and hike through the Rhine Valley in Germany. Plus, there’s Northern Ireland, Namibia, Macau and so much more. 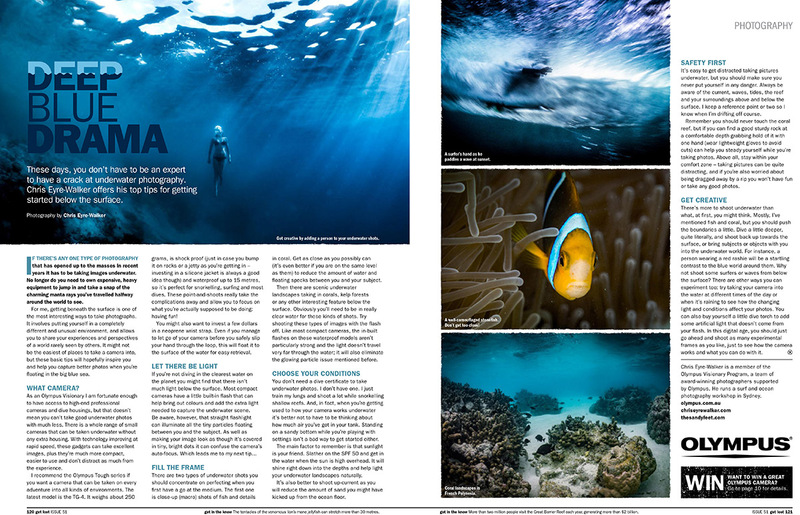 In issue 51 I shared a range of underwater photography tips along with some of my favourite underwater shots from French Polynesia and Australia. Magazine content: In 2017 make a resolution to follow adventure. We’ve found six amazing journeys to get you started. Camp under the northern lights in Canada, enter the wilds in Guyana, slip and slide through the canyons of Corsica, cycle into the mountains to meet the gorillas of Rwanda and cruise the waters of Raja Ampat, where incredible creatures thrive under the waves. Plus, you’ll also go on a road trip to see where continents meet in Iceland. Relax a while in Thailand’s idyllic Trang Islands. Travel from Atlantic to Andes in Argentina. Plus there’s glamping in Morocco, Memphis blues, Paris, South Australia and so much more. 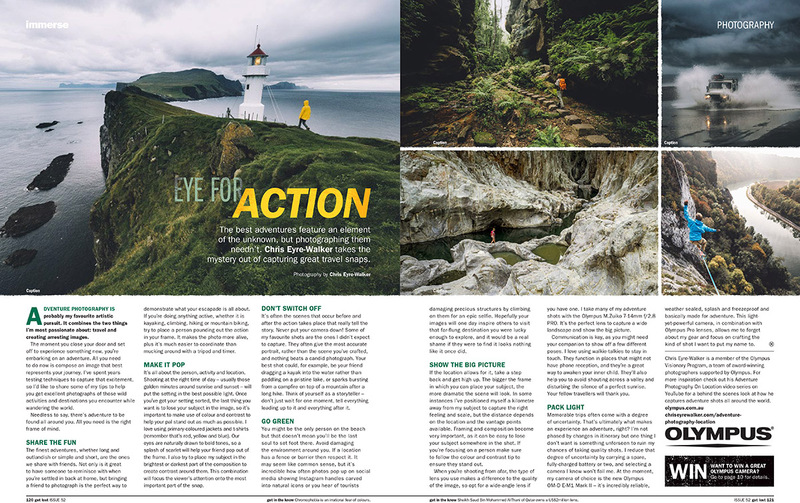 In issue 52 I shared a range of action photography tips along with some of my favourite action shots from my adventures all around the world. Magazine content: As we all know by now, the formula to winning at life is action plus downtime. Add someone special into the mix and you’ve got a match made in heaven. So in this issue we’ve rustled up 13 rather unconventional two-part honeymoons that even Cupid himself would struggle to surpass. There’s also the chance to witness whipping and worship at a loopy Peruvian festival, a fashion designer’s guide to Tel Aviv, Taiwan’s off-the-radar surfing scene and so much more. I’m excited to announce that I’ve signed up for another year with GetLost and I’ll be sharing more of my favourite work and stories behind the shots with you in the coming year. GetLost is all about the alternative way of travelling. Something my partner Freya and myself are really excited about and talk about every day on our very own travel blog. But, if you’re a little bit like me, get the printed version, Nothing beats the feeling of holding and flicking through a magazine. I’m on Photog Adventures Podcast! I am with you. It took a lot of packing too much for me to appreciate the luxury of traveling light.